This 94 acre parcel is just a small portion of a very large and intact mature forest block known for its excellent birding opportunities. The area is rugged and rocky with great outcrops, formations, glacial erratics and stone walls. The west side trail is easy to moderate with some elevation change down to the pretty Lantern Brook and stream crossings in two areas. 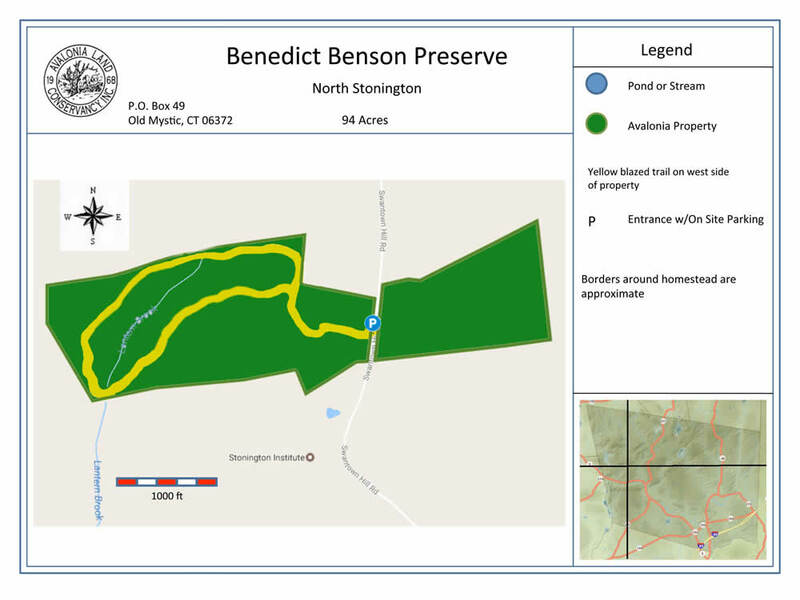 The Preserve was donated by Mimi and Brad Borden and named in honor of Benedict Bengt Benson, the first owner of the property and grandfather of Mrs. Borden. Location info: Two parcels intersected by Swantown Hill Road. Listed as 100 and 101 Swantown Hill Rd. West side parking area off road at Trailhead with approximately 1.5 miles of trails blazed yellow. East side no trails at this time.